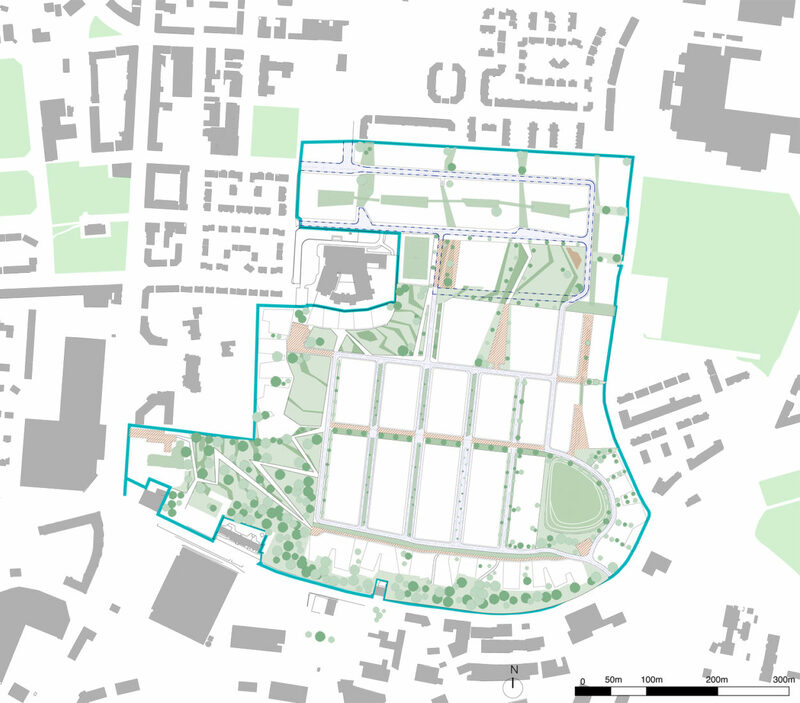 The Cowlairs masterplan is based on the principle that surface water be retained on site as far as possible to create an urban landscape of blue-green routes and sculpted open space. 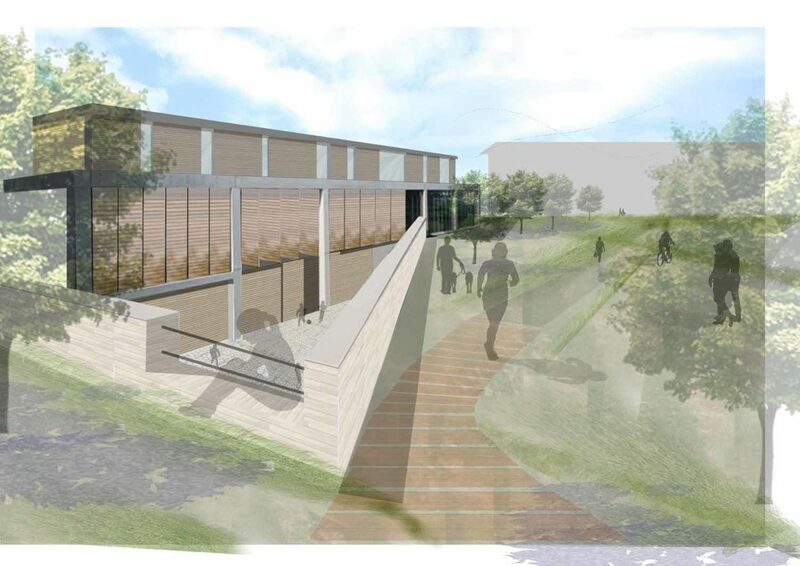 This approach was developed in response to the considerable hydrological constraints of the site. The strategy is further enhanced by the implementation of sustainable principles such as open parklands for water retention and urban wetlands overlooked by adjacent housing developments. The design study proposes that the perimeter of the site is intensively developed to create a strong urban edge with tenemental style properties and terraced houses linked by back courts and homezones which provide surface water management. The existing terraced area to the centre of the site is populated with stepped family houses overlooking landscaped swales connecting the housing to new open space and local creche/retail facilities. Defining the urban edge - A series of terraced and tenemental houses define the urban edge between existing dwellings and the central greenspace. The street pattern and back courts are arranged to provide a route for surface water, which runs from the north of the site to the south- east and western edge. 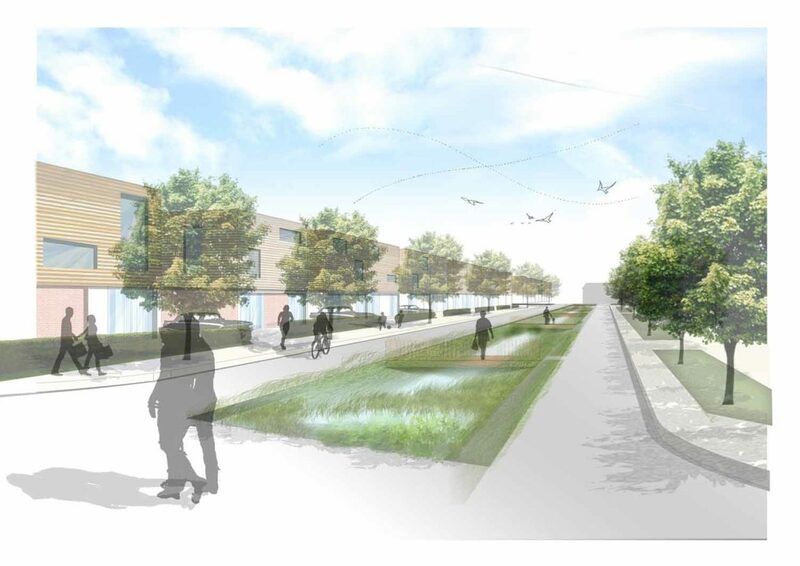 The terraced housing has front and rear gardens with a shared surface street arrangement designed to the principles of the Scottish Government’s recently published ‘Designing Streets’ 2010. Tenemental housing is arranged in blocks, which step down the sloped topography to the east. These blocks are also stepped in section to provide level back courts with undercroft parking from Allander Street. A wet pond sits to the south east corner, acting as a retention area for discharge to the Forth and Clyde Canal in the event of an extreme flood. 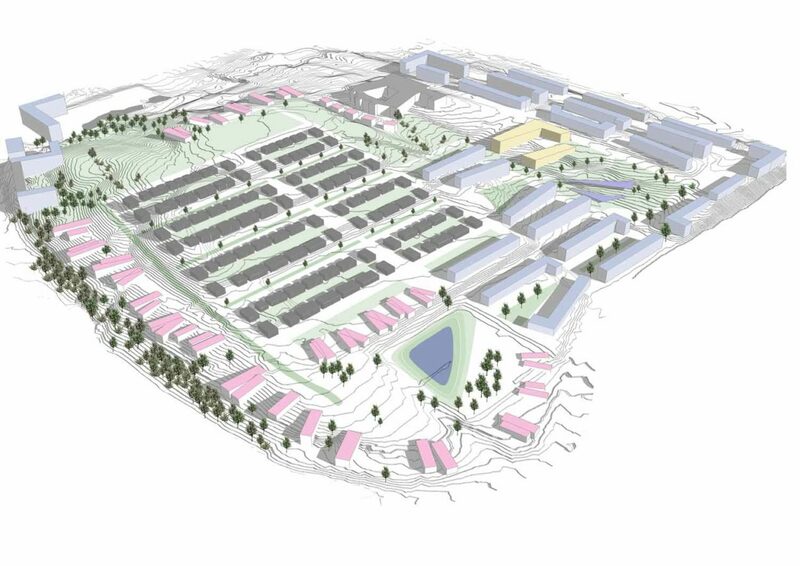 It also provides amenity benefits and links to a pedestrian route running from east to west across the site. Gateway and green corridor - A green corridor of open space and pathways connects the east and west of the site. The open space is sculpted to provide a dynamic landscape of paths, terraces and courtyards. New and existing roads feed into the green corridor to provide a network of blue-green routes which connect into the surrounding path network and neighbourhoods. The site is within close proximity to the Possilpark Town Centre. 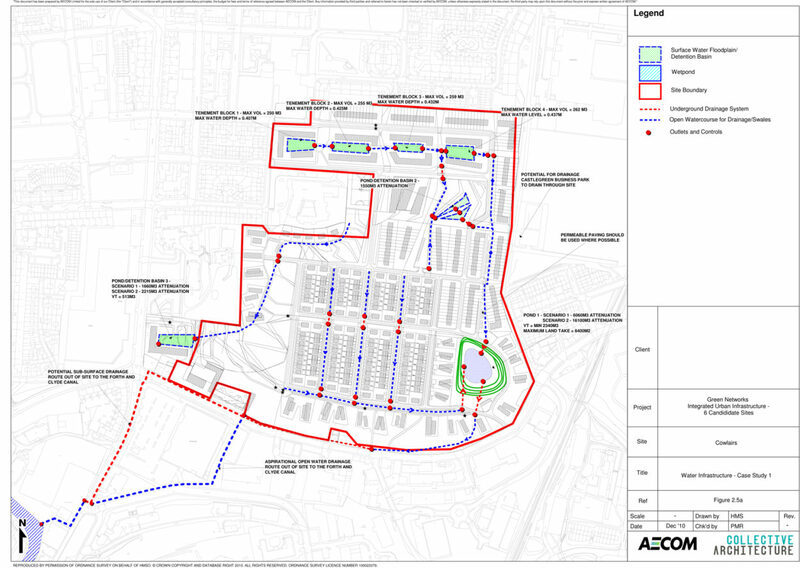 Nevertheless, it is proposed that a new mixed use gateway building is located at the northern vehicular entrance into the site adjacent to the existing primary school to provide immediate local facilities. This might house a local creche, small work or retail units with associated courtyards and open space with a relationship to the existing school and green corridor. 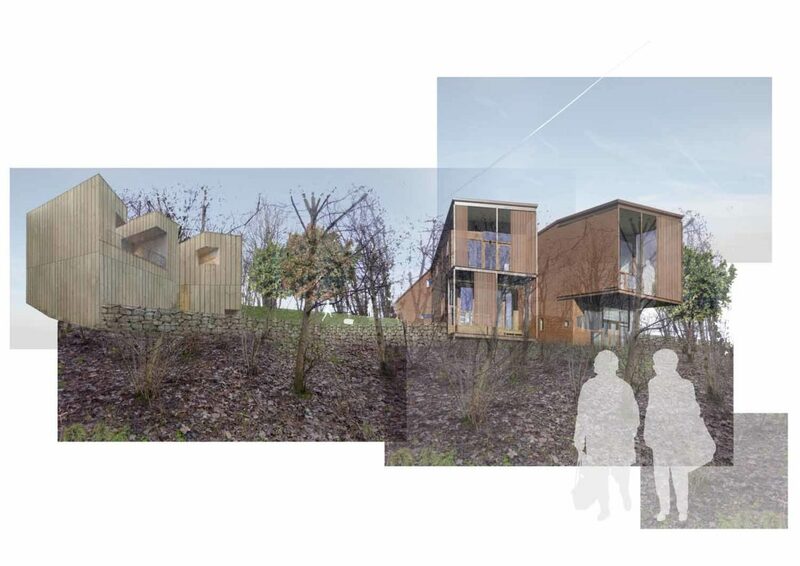 Building on the hillside - The south facing slopes onto Keppochhill Road provide the opportunity for stepped housing typologies, which might not require large areas of associated land. This will allow trees and parkland to pass around and below. A series of linear dwellings, accessed from the rear, step down the slope. These look towards Glasgow City Centre and offer the opportunity for spectacular views via large windows and external balconies. The south facing aspect lends itself to solar collection and passive heating and ventilation. These generous, desirable dwellings would be suited to a variety of residents ranging from the elderly to young couples. There is also a clear association between the hillside dwellings and the terraced plots. Forming terraced plots - The large flat areas of land to the centre of the site form a series of stepped terraces. It is proposed that these areas be used to provide a series of streets and swales overlooked by semi-detached houses.